It’s easy to get caught up in the unrelenting noise of conventional wisdom in business and life. We feel this sense of urgency to fit the mold of the latest marketing trends, try to figure out how to create an ad for our business, start blogging to attract an audience, and attend every networking event we can find. Soon the chaos of trying to keep up just feels insurmountable. So where do we start and how do we tease apart what will actually move the needle in our business and what won’t? Start with the platforms where your audience is already engaging and looking for information, products, and services. For example, according to Edison research, 84% of Moms use Facebook and 72% of Social Media Moms use Facebook the most of any other platform. So if your business caters to other Moms, you should be advertising and engaging on Facebook and create an ad right from the platform. 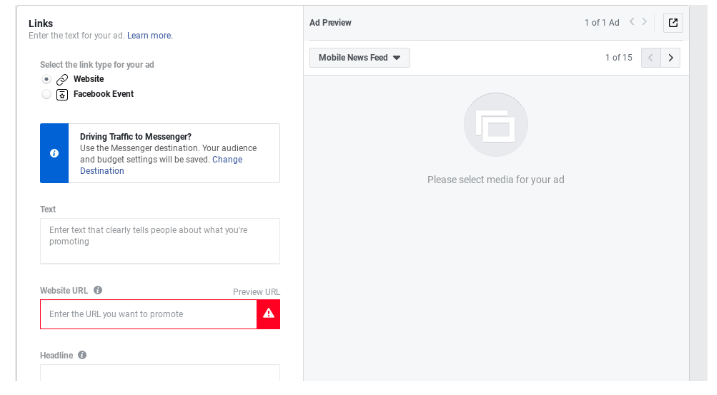 Launching your first Facebook ad can feel intimidating and confusing if you’ve never done it before, but isn’t that difficult. You just need the right step-by-step approach to get started. 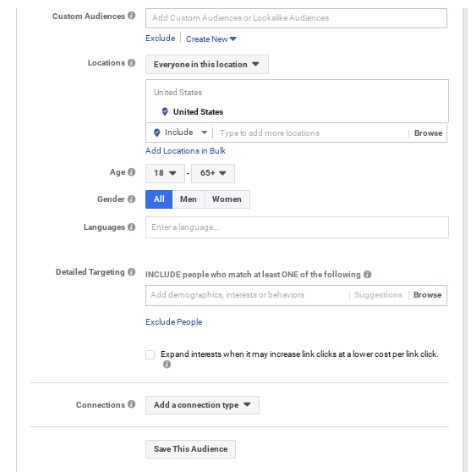 If you don’t already have a Facebook page, you’ll need one to create an ad. Go to Facebook.com/Business and click "Create a Page" in the top right hand corner. This will give you the option to create your own Facebook page for your business, brand, product, or community. But don't worry, you don't need a robust business to get this going. This page serves as a place for your potential clients to find you and connects to your Facebook ad. At the top right of your Facebook page, click on the triangle and select Business Manager. Once you're inside the Business Manager, you should be able to see the Pages you've created. Click on it to kick things off and create an ad. Look for a Green button that says “Create” to start building out your campaign and click. Next, you can select your marketing objective. If you're not sure where to start, we recommend selecting “Traffic” to get started to drive the most activity to your business. Now you can fill in your Campaign name to keep track of multiple campaigns you may want to run. Next, rename your new ad set to reflect the demographic you're hoping to target. You'll probably see a "US - 18+" under Ad Set Name. Change it to something that makes sense for your campaigns like "Pepperlane Moms" or “Local Women, 24-46” - whatever best describes the audience you’re trying to target. You should also make sure your Traffic is set to go to your website and not app or Messenger. This is the step where you can really see the power behind what Facebook can do and use it to create an ad. You can target your audience by location, age, languages spoken, and even include highly detailed information. Maybe your ideal audience are the Moms of preschoolers. Facebook can help narrow that down for you. 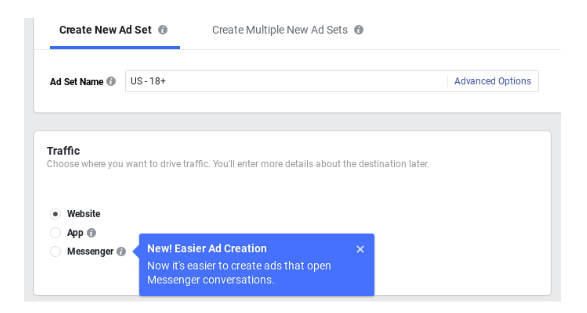 Unlike many traditional forms of marketing and advertising, you can leverage Facebook for just a few dollars a day to create an ad--or even for your entire campaign. Set your budget to what you can afford like $5 a day. You can also set your optimization for Ad Delivery to Link Clicks, or whatever you feel is best for your marketing strategy. When you’ve set your budget and are ready to create an ad, click Continue. 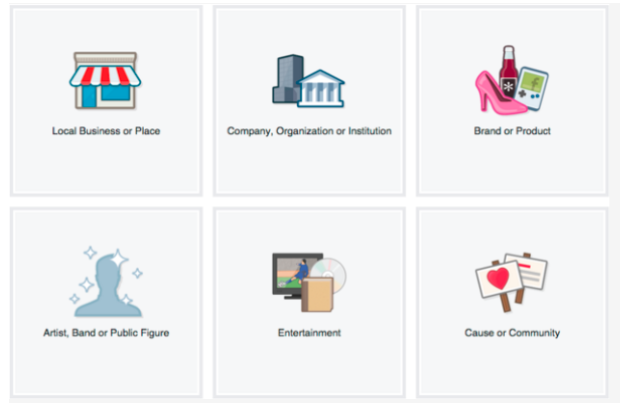 From here, you can select your Facebook Page identity so your ad will link up with the right entity. Next, choose your format from a carousel with multiple images and videos or a single image. If it's your first time creating an ad, just go with something simple like a Single Image ad. Now is where you get to play around with images to create an ad. Upload your own professional image or choose from one of Facebook’s free stock photo images instead. After your images are in place, enter the text for your ad and a headline. Think of a call to action that speaks to your core audience like, "No time to meal plan?" The "text" of your ad could then read, "Hire a Mom and business owner to meal prep and deliver nutritious meals for you and free up more time to focus on your family and business.."
Choose a Call to Action (or CTA) like ‘Learn More’. 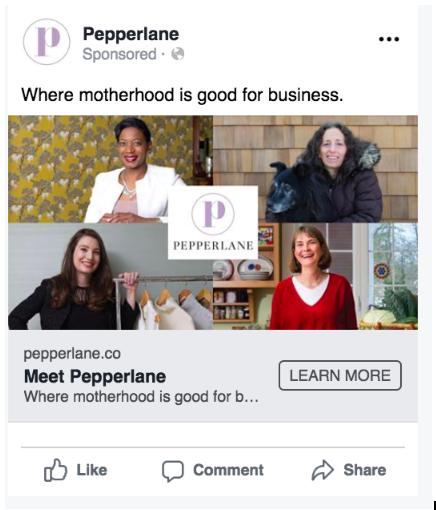 Be sure to add your Pepperlane profile link in the URL: https://pepperlane.co/jess to direct visitors to your business. Do a quick peek at the preview to make sure it looks okay, and then you’re ready to go! Hit confirm and get your add running. It’s important to do some experimenting with your ads. Watch your budget carefully and swap out photos and text to see what performs the best. You can also play around with your audience to see which group and demographic combination respond the most. For example, Moms in the Boston area of preschoolers may not hit the mark, but making some adjustments to include a wider area with slightly older kids may move the needle on your business. Remember that your Facebook ad is also a business expense. Ask your potential clients how they heard of you and notate how much you spent on the ad in comparison to how many new leads converted into business. You should be able to get a sense of how much ad spend you need to gain one new client. Now that you’ve created your first ad, it’s time to sit back and see what happens. Although it can be tempting to turn off and on your ad, you need to give it some time to work and really see what happens. In other words, success doesn’t happen overnight! What drives you? Everyone has a different reason to pursue our passions. Recognizing what drives you is not always easy, but this deep motivation can truly be what pushes us to take action. Do a quick search, and you’ll find a million articles on how to differentiate your business from the crowd. Improving the customer experience, showing value, defining your niche, providing exceptional customer service: those are all solid suggestions. You’ve done it. You’ve increased your web traffic by 200%. All mere mortals must bow down before you. You are a marketing goddess. You eat SEO for breakfast. You are on cloud nine and are dutifully waiting for new sales to start rolling in. And yet, somehow, nothing is happening. There’s no new sales. You check your traffic and confirm: yes, your web views are doubled. You help your kids solve some crisis involving stolen dinosaurs. You check the website again: Nothing. It all should be working, and yet it’s not. Why? Is it your keywords? Your SEO bids? Your facebook ads? Your mind starts to spiral into a million reasons why. But the answer might be easier than you think, because increased traffic isn’t necessarily the key to success in sales— it’s conversion of the potential customers you already have.